This is a guest post by: Christina Sanders who writes for several blogs nationwide. Fresh produce is an important part of a healthy diet, and many fruits and vegetables have been found to prevent other diseases as well. In the summer it’s easy to find fresh produce at the grocery store or local farmers market, but the abundance quickly diminishes with the cold weather. 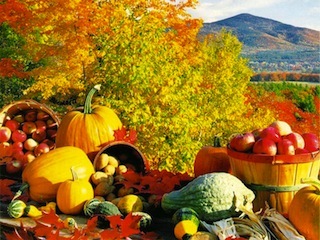 So what are some all-natural foods that are abundant and healthy to eat in the fall? Apples: While peaches and berries disappear with the cold weather, fall is a great time to stock up on the doctor’s favorite fruit. Apples have antioxidants and fiber, and the harvest season only begins in August. Make sure to eat the skin for the full nutritional benefit. Dates: Originating in the Middle East, dates are low in fat and high in fiber and potassium. With their natural sweetness, they make a perfect fall dessert from September to December. Grapefruit: With a long harvest season from September to April, this tart fruit will last you clear through winter. A single grapefruit contains 75 percent of the recommended Vitamin C daily intake and is a good source of lycopene, which may reduce the risk of cancer and cardiovascular disease. Brussels Sprouts: This bitter vegetable contains high levels of Vitamin K, folate and iron. It is also a good choice for an alkaline diet, foods that decrease the amount of acid in the body. Harvest season is from September through March. Pumpkin: More than just jack-o-lanterns, pumpkins are a nutrient-rich squash full of Vitamin A, fiber and potassium. Start buying pumpkin in October and use it through February. Rutabaga: You may not have heard of this favorite Swedish vegetable. A cross between a turnip and cabbage, rutabagas are an excellent source of fiber and Vitamin C and are in season October through April. To learn more about the alkaline diet please visit here.